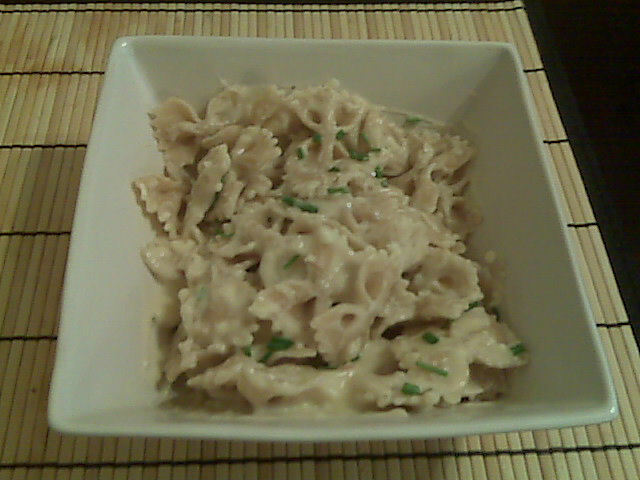 Mmmm, creamy garlicky goodness. So out of reach for folks trying to watch what they eat. Well, not really. I used to make this recipe for my sisters while we watched saturday morning cartoons. I have always had a problem digesting a lot of butter and cream so I had made up this alternative long ago. It was almost a ritual of sorts. 11:30 would roll around, the cartoons would be winding down, and I would pop out the pans and get started on the alfredo sauce for my sisters. They would gobble it down happily while we finished up our watching with a little reading rainbow. Later, I would find this recipe doubles up nicely to feed a crowd for a pasta dinner. A nice alternative to tomato sauce all the time. Paired with a whole wheat or multigrain pasta this is a very happy dish indeed. In a medium saucepan melt the butter and combine with the flour. Slowly add the two milks whisking them in so that no lumps form. Continue to heat until the milk is hot and begins to thicken. Add the garlic. Gradually stir in the cheese. Stir until cheese is melted and the sauce is thickened. Toss with your choice of pasta and sprinkle with fresh chives to garnish. Serve! Makes 6 servings. Each serving contains 171 calories, 9.5 grams of fat, and 0.2 grams of fiber. Definitely a health conscious way to indulge! I have served this to crowds who never knew this was a diet friendly recipe…it was well received every time. No need for heavy creams and a stick of butter to enjoy a little alfredo now and then! In the picture I used whole wheat bows…very tasty and good at trapping that sauce. If you want to up to protein toss this with a bit of grilled chicken for a tasty chicken alfredo! This entry was posted in Comfort Foods, Craving Buster, Dinner and tagged sauce. Bookmark the permalink.